Welcome to the remarkable world of Bo Burnham’s cinematic lightning rod Eighth Grade; a minor miracle of a film that exemplifies that old adage that film is an empathy machine. Burnham is a sickeningly young male director (29 at the time of writing), whose first feature wiggles its way into the complex and daunting world of being a girl. His star is newcomer Elsie Fisher; a wonderful find, wide-eyed and acne-poked, who mercifully doesn’t conform to the pageant-winning pristine starlet look typified by your average Disney Club kid. She plays Kayla Day; an introverted, self-aware middle schooler who lives with her single dad (Josh Hamilton). Kayla is a typical American kid. She prizes her phone above all other possessions, obsesses over social media, and even expresses herself through its persistent digital stream, making a series of self-help vlogs that garner few likes or views. At school she rarely speaks, has no friends, crushes on a dumb boy named Aiden (Luke Prael), and generally tries to navigate the constant horrors of being an adolescent. Burnham gets in close with his subjects. Fisher is commonly lit by the cold glow of her laptop or her cellphone. Meanwhile, other kids are scrutinised at desk level. He captures the fidgety awkwardness of childhood and the clumsy no man’s land on the other side of which lies maturity. The film is at its most oppressive and uncomfortable when sexual elements are introduced into the peripheries of Kayla’s life. We immediately come to feel protective of her, and without tipping into the sensational or exploitative, Burnham doesn’t shirk from making these first forays and investigations fraught and perilous. Seriously, boys are awful. Wisely, Eighth Grade never gets too bogged down in these horrifying near-misses. This isn’t plot driven cinema, but rather a warm, closely observed character study. Burnham’s openness, his generosity to his actors and his subject matter, recalls the sugar-rush sprightliness of Sean Baker’s The Florida Project, which similarly got low to the ground in order to depict a particular micro-climate from the perspective of a child. Baker’s film had a political twitch to it, and is one of the best films of the decade. Burnham eyes controversial topics (witness a chilling drill exercise for what to do if there’s a mass shooting at school), but more commonly his focus is on expressing purely emotional beats. Kayla is the centre of every scene. The world happens around her. By extension we share in her unbridled excitement when a bunch of older kids invite her to the mall, for instance. The quote I opened with from The Virgin Suicides comes embroidered with melodrama and cynicism, but to a girl the age of Kayla, the world is overwhelming. Her borderline panic attack arriving at that party is, to this viewer, wholeheartedly relatable. The pervasiveness of the internet in these kids’ lives is a true reflection of the evolution in society, but Burnham doesn’t wag a finger at this. He is very fair in his approach and understands how important the online world is to the young. 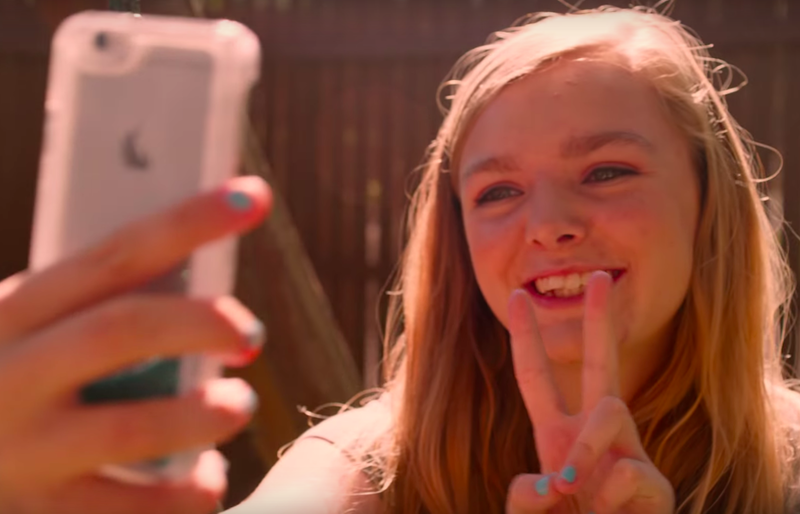 True, there’s the suggestion that it isolates and is therefore in a sense responsible for Kayla’s reluctance to shine in the real world, but Eighth Grade is smart enough to acknowledge that there are other factors at play. Life isn’t so binary. His approach is non-didactic and all the better for it. And as we’re wowed by the layers and emotional resonance of this teenage girl, we’re also charmed by her goofy father. Josh Hamilton is a delight in the role, and in the final act is given the best dad speech since Michael Stuhlbarg at the end of Call Me By Your Name. After legions of bad dads in cinema and TV, its such a relief to see some pretty good ones coming through. Eighth Grade is distributed by A24 who champion indie filmmaking and over this decade have brought us such marvels as Moonlight and The Witch to name but a couple. Burnham’s film is another feather in their cap. And if their output has taken on the reputation of hipster catnip, so be it. This is a hit I couldn’t possibly have resisted. Eighth Grade was absolutely one of the films I was most looking forward to this year. To borrow from the Little White Lies playbook, my anticipation level was a 5. That it breezes past these expectations is the kind of delightful experience found all too rarely. It’s a precious thing. In my life away from this keyboard, this laptop, I’m a man in my mid thirties who considers himself equal parts masculine and feminine. And while I wouldn’t presume to know what it is to be a girl, Eighth Grade showed me, to a very real extent, myself, and I imagine Burnham along with it. From its creator and star, this is one hell of an opening salvo. The race for best film of the year is on.